Dr. Michael S. Sweeney attended the sneak preview screening of a documentary film, featuring him as an expert speaking about war correspondents, on March 9. The film had its debut aboard the aircraft carrier U.S.S. Intrepid, anchored in the Hudson River on the west side of Manhattan. 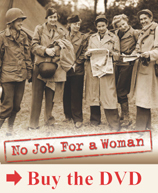 Sweeney discusses female war correspondents of World War II in the movie “No Job for a Woman,” produced by filmmaker Michele Fillion with a grant from the National Endowment for the Humanities. The film focuses in particular on print reporters Martha Gellhorn and Ruth Cowan, as well as photojournalist Dickey Chapelle. Sweeney was interviewed in May 2009 in New York City. He provided context about the difficulties faced by female war correspondents, as well as the redefinition of wartime news through their focus on ordinary citizens caught up in the clash of armies. Fillion is in negotiation on where the film goes next. Options include broader distribution on screen as well as broadcasts by television networks such as PBS.